The warm, lovely and spacious Great Room offers all you might need when wanting to relax, read, watch tv or movies, listen to music, enjoy the warm fireplace, enjoy snacks, or just sit in the many offered seating areas and enjoy the many wonderful views. It is a great area to play games, do crafts, hobbies or other fun things your heart desires. It offers exits out onto a large partially covered deck where more seating is presented. The beautiful entrance into the lodge is a large space which is great for a wedding party or others to enter and relax. 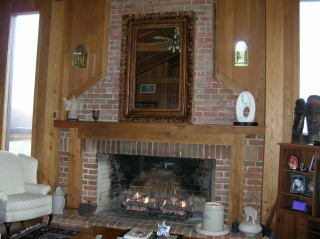 COZY UP BY A WARM FIRE IN THE GREAT ROOM. BRIDE KACEY ENTERING LODGE FOR RECEPTION. 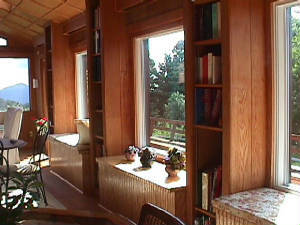 WINDOW BOXES PROVIDE EXTRA SEATING IN GREAT ROOM.